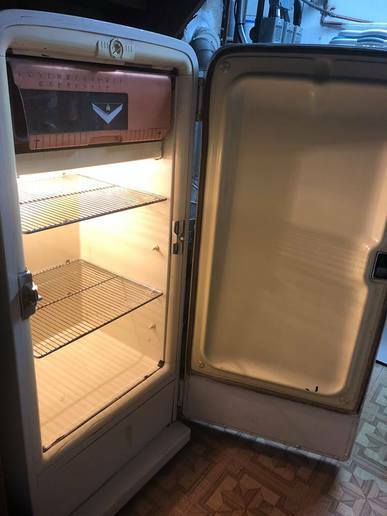 Can anyone tell me what year this IH fridge is and what color options it came in? The guy said it was green when he got it so he painted it white. I know the chrome pieces have been painted over also so hopefully i can clean the paint off. Any info will be appreciated. 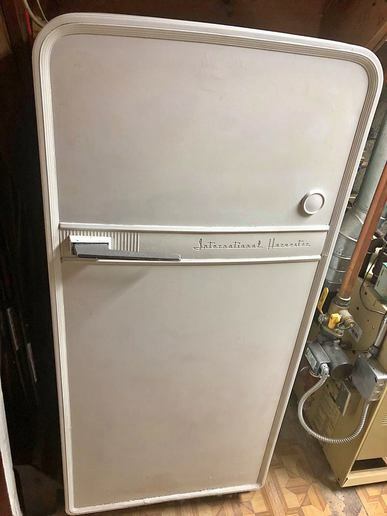 IH stopped building fridges in 1955. They sold the fridge division to Whirlpool I believe. I don't know what colors were available in 55 but in 1951 they offered about 8 colors with a lime green being one of the colors. The round emblem on the front had an IH logo in the center of it. The logo may still be there if you carefully remove the paint. Your IH fridge is missing the bottom drawer but most will never know. Yours looks very similar to the 1955 model I saw a picture of. Mom and dad's was bought new right after ww2. It lasted till 1960 or 62. It was white. Parents had one looked a lot like that. Was a pea soup green color. Was still using it when the house burnt in 98. We have 3 at Junkshow. If I recall IH changed to the flat face door in ?54-?55.